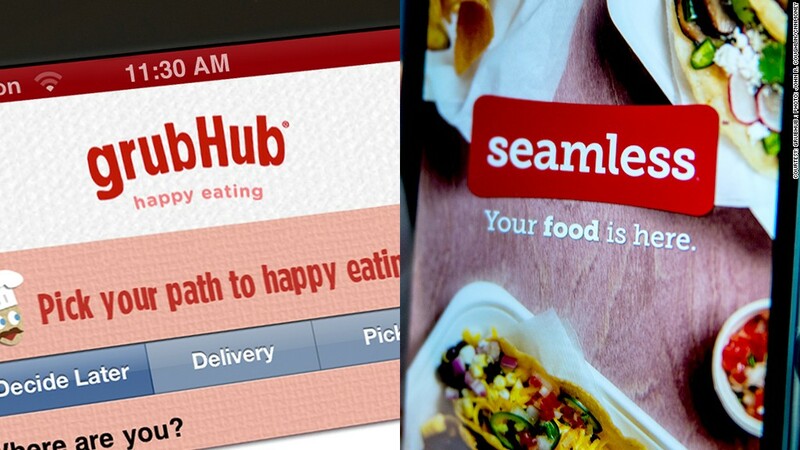 GrubHub and Seamless, two big food delivery services, are merging. Your options for takeout orders just doubled. Two leaders in restaurant food delivery, Seamless and GrubHub, announced that they will merge on Monday. Customers from more than 500 cities will be able to order from 20,000 local restaurants through the joint company. The companies said in a statement that the merger will allow them to pool technology and offer orders from an expanded list of restaurants in the U.S. and also in the U.K.
For instance, Jonathan Zabusky, Seamless' CEO, said the merger would combine its popular iPad app with GrubHub's "Track Your Grub" feature, which sends customers updates on the status of their order. The two companies made a combined $100 million in revenue in 2012, according to the press release. GrubHub's co-founder Matt Maloney will be the CEO, while Zabusky will serve as president of the new company.